Abercromby Square is to become the permanent home for the Liverpool Heroes Memorial which commemorates Captain Noel Chavasse VC & Bar MC, the only man to be twice awarded the military’s highest award for valour, the Victoria Cross, in the First World War and fifteen other Liverpool-born Victoria Cross recipients. 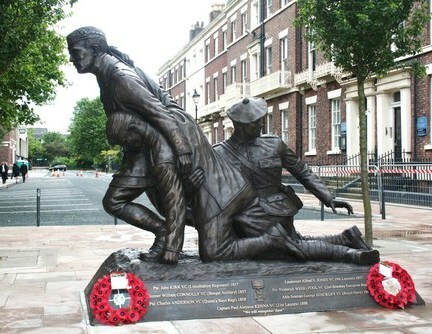 Designed by local sculptor, Tom Murphy, the bronze statue depicts Captain Chavasse and a Liverpool Scottish stretcher bearer attending a wounded soldier and is referred to locally as the ‘Chavasse Statue’. In 1916, as a surgeon-lieutenant, Chavasse rescued wounded men from no-man’s land under heavy fire, sometimes just 25 yards from enemy lines. He saved the lives of more than 20 men and was honoured with his first Victoria Cross. He was awarded the second posthumously after he continued to rescue and treat men during conflict at Wieltje, Belgium, though mortally wounded himself. Captain Chavasse died on 4 August 1917, at the age of 32, and is buried at Brandhoek New Military Cemetery in Belgium. I have visited Chavasse’s grave in Belgium on numerous occasions. How tremendous to happen upon this beautiful memorial whilst visiting Liverpool University this weekend. A lovely setting to reflect on the sacrifices of previous generations during our busy lives. Well done Liverpool!!! Very thought provoking every time you pass it. Most of us have an easy life, and we should be thankful for it. One point of note though, according to my untrained histroical brain, three people have been awarded the VC and bar (http://www.stephen-stratford.co.uk/two_vcs.htm). Its a beautiful statue of Noel Cavasse, the brave and beautiful young man who was killed in his prime. I’m so pleased its going to be kept in Abercromby Square as I walk by it every day. What marvellous tribute to him and the VC Memorial Association.